Laura Bassett is a professional footballer and a key member of England’s Lionesses. Bassett has over 50 international caps, including a bronze medal from the hugely successful 2015 Football World Cup. To date, Laura has competed in two World Cups and two European Championships, including securing a silver medal in the 2009 Euros. Domestically, Laura Basset is one of the FA’s Women’s Super League’s most revered players. 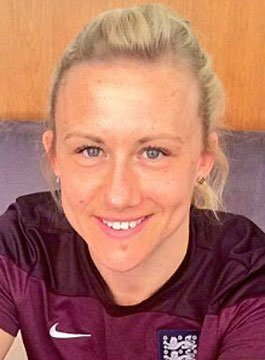 Currently the captain at Notts County Ladies FC, Laura has also played for Arsenal, Chelsea, Leeds and in 2012 helped Birmingham City win the FA Cup, and finish second in the WSL and in the Continental Cup. She also enjoyed similar success in 2009 with Arsenal winning the FA Cup and the Premier League. Laura, who grew up in a football fanatical family, played for England Under 19s through to the Under 21s before making her senior England debut in 2003. She also became one of the first female players to be awarded a professional contract in 2009, and has since being centrally contracted by the FA. She is also a UEFA Level 3 Licence Coach. As a motivational speaker, Laura Bassett is well qualified to share her experiences. Whether it’s talking about leadership as captain of her Super League team, or overcoming adversity when she had to mentally bounce back from scoring an own goal in the Football World Cup semi-finals, or being a prominent figure in the challenging world of a male dominated sport, Laura has a story you want to hear.